My mom grew up in Hawaii with lots of Asian influences. Hence, we grew up on this chicken. It is traditionally made with boneless, skinless chicken thighs, but since those haven't been on sale lately around here I made it with breasts. 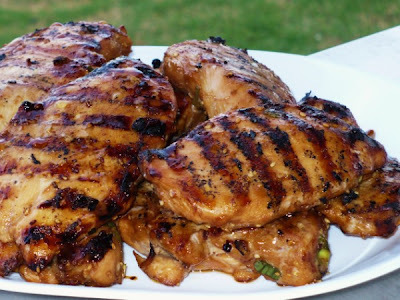 Breasts are okay, but the thighs tend to be more juicy and flavorful and I prefer them. There is certainly enough of the marinade to reserve some for heating and serving on the side if desired. I like pouring some on steamed white rice. Yum! Combine all ingredients in a gallon-size Ziploc bag and marinate in fridge for at least 2 hours. Spray grill with cooking spray. Preheat grill to med-high heat. Grill chicken for 8-10 minutes or until done, turning once half-way through cooking time. Serve with steamed rice and veggies. Dave loved this and let me tell you the man got up in the middle of the night and ate the last piece cold. lol what did I marry? I've actually been known to eat it cold myself...though I don't think it's ever been in the middle of the night, lol!